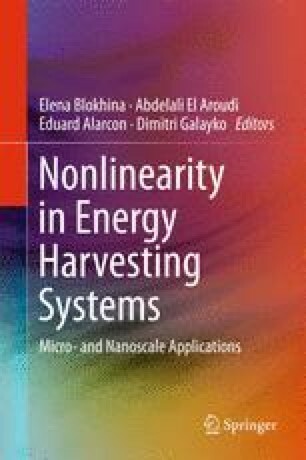 The chapter discusses mathematical modeling and numerical analysis of nonlinearities due to mechanical end-stops in vibration energy harvesters by eigenvalue approach and time domain simulations. We consider end-stops that limit the maximum displacement amplitude of the proof mass motion within finite package’s size. Proof mass motion is strongly nonlinear on impact at the end-stops. The system behavior is studied through its state equations. The phase space trajectories are investigated with varying system parameters and coefficients of restitution. The modeling of the restoring force for the coefficient of restitution equals zero simplifies the phase space trajectories at large acceleration amplitudes which otherwise is complicated. The average output power increases with mechanical excitations and then saturates at acceleration amplitude which leads to impacts. Thus, the average output power is weakly dependent on excitation levels. The power lost on impact for inelastic collision can be collected via integrated electronic circuits. Another smart solution is introducing active transducers replacing inactive end-stops in the harvester. The chapter presents a device concept of transducing end-stops scavenging additional power from the impacts. The transducing end-stops not only benefit total output power but also enhance response bandwidth. This work was supported by the Research Council of Norway under Grant no. 191282. We thank Prof. Einar Halvorsen for useful discussions and suggestions.